What's Up Those Baseball Sleeves? Lots Of Data, And Privacy Concerns Professional athletes use wearable technology to improve performance. But key questions remain over who owns the data and how the information is used. 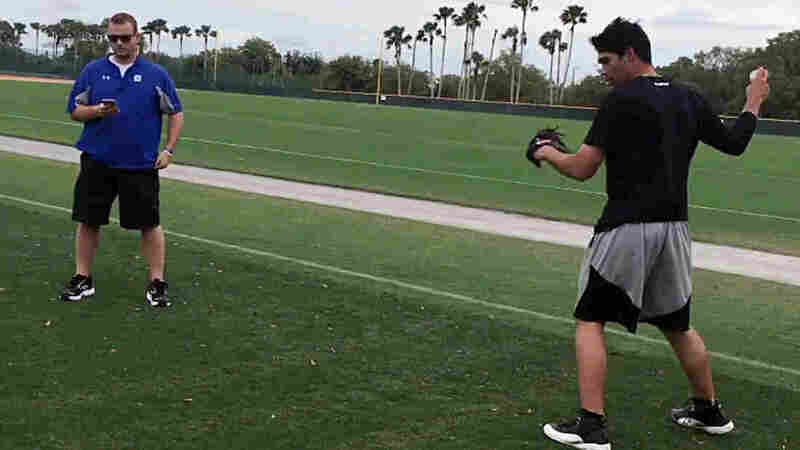 Ben Hansen (left) watches data on a hand-held device as Pittsburgh Pirates prospect Matt Benedict throws a ball. Benedict is wearing sensors that recorded 39 sets of measurements. In a stats-driven sport like baseball, it seems we know everything there is to know about a player. From batting average to a pitcher's power finesse ratio. Measuring a player's ability isn't limited to his or her skill. There's also a wealth of information in an athlete's body. Wearables that track bio-information have become more prevalent in elite sports, and potentially important to player development and health. How that growing glut of information is used — by the companies that gather it and the teams that use it — remains a concern. In an industrial park in Kent, Wash., near Seattle, it's hard to tell which of the featureless buildings is which. Until you hear the unmistakable pop of a pitched baseball into a catcher's mitt. You know then you've arrived at Driveline Baseball, a training center for players from high school to the major leagues. It has the usual weight room, and pitching and batting cages. But there's also a biomechanics lab and an emphasis on data collection. Driveline Baseball research assistant Michael O'Connell puts a sleeve on pitcher Luke Glavin's throwing arm. The sleeve, a wearable designed by Motus, measures factors such as elbow stress and arm speed. 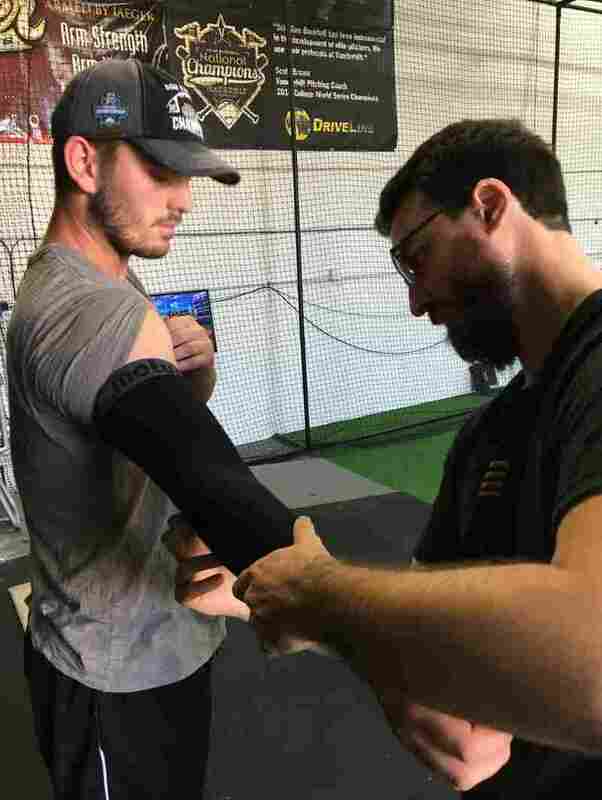 On a recent day at Driveline, pitchers interrupt their throwing sessions to put on what appears to be a common compression sleeve. Research assistant Michael O'Connell helps with the fitting. "So just put your arm out, palm up," O'Connell says to a college-age pitcher. O'Connell slides the sleeve onto the player's throwing arm so it stretches from midforearm to just under the shoulder. "Just keep an eye on it. If it slides down let us know. We'll be watching [your] readings." What makes this device uncommon is the small sensor nestled inside a slot in the sleeve. "It's probably just a little bit bigger than someone's thumb," O'Connell says. "It sits on the inside of the forearm, about two finger widths below the funny bone." When the pitcher throws, gyroscopes inside the sensor start to churn out information. "The arm speed metric measures how fast the forearm is rotating," O'Connell says. He is now sitting outside the pitching cage, watching the measurements blink onto a laptop screen with each throw. "The arm slot [measurement] is going to give us an idea where his arm is in relation to the ground," he says. "So 90 degrees would be straight up; zero [degrees] would be a straight sidearm [pitch]. Shoulder rotation give us a guess of how much external rotation or arm lay-back they're getting." But the most important metric from the sleeve is elbow stress, or torque. "It's going to give us the best idea of how stressful is this throw on the elbow," says O'Connell. It's this measurement that could, in fact, be significant for the future of baseball. In recent years the game has had what's been called an epidemic of Tommy John surgeries. That's the revolutionary elbow procedure named after the first player who had it. In 2015, elbow injuries were the "leading cause" of baseball players' landing on the disabled list, according to Forbes, with a reported $420 million in pitchers' salaries "wasted" on the DL. The sleeve could be an important weapon against the epidemic, by detecting stress or weakness in the elbow early on. "The hope is we can train players to withstand fatigue," says Driveline founder Kyle Boddy. "[To] rehab them faster and better. And hopefully prevent them from having surgery at the beginning." Boddy says the sleeve also can help players whose elbows are in good shape. He points to the experience of Major League Baseball player Dan Straily. Now a starting pitcher for the Miami Marlins, Straily worked quite a bit with the sleeve, and the device helped him with what had been a troublesome shoulder. "As his [pitching] velocity increased, his elbow stress did not increase." Boddy says of Straily. "So we knew that it was probably pretty safe to omit extra work on his elbow, and take that time and that effort and put it more toward his shoulder to make sure his shoulder stood up to the test of throwing 200 innings in the big leagues. Which it has." After his practice session at Driveline, Luke Glavin emerges from the pitching cage and takes off his sleeve. Glavin pitches for Lehigh University. He has been using the device for two weeks — one would assume he is better off knowing all about his throwing arm. "Yes and no," Glavin says. "I mean I think it's good to have knowledge so you can train the most efficiently. But sometimes, I feel like you get information overload and you start worrying about things you would've done naturally. [It's] interesting to know it all, but sometimes when you're playing you just have to go out and be athletic and let things take care of themselves." The sleeve is just one of a growing number of wearables for elite athletes. A band around the midsection can test the electrical activity of an athlete's heart, as well as the breathing rate. Wristband wearables can track skin temperature and body movement when an athlete is sleeping. Athletes in many sports — from pro football to basketball to cricket to auto racing to lacrosse — are delving deeply into their personal biologies. But the measurements, in the hands of their employers or potential suitors, potentially could backfire. "[Wearables] are helpful if you've got a young star and you want to protect his arm," says Alan Milstein, an attorney who lectures on sports and bioethics. "It's helpful for any athlete if the purpose is to benefit that athlete to make him perform better. But if the purpose is to find out, 'Geez, is this guy really worth it? Should we sign him to another year? Nah, he looks like he's really failing. Let's get rid of him,' then it's no longer in the athletes' best interest to have the team be able to monitor every aspect of their health." This sets up a potentially huge battle over privacy. "As soon as we start talking about stress [on] the arm, heart rate, many other types of values that can only be collected with wearable data," says Driveline's Boddy, "now all of a sudden we're talking about a player's value. Data they're generating from their own biometrics. Who owns that data? Who should have access to it? How should it be protected?" Driveline encrypts all the data from its athletes with "military grade" encryption, says Boddy, and players have to sign consent forms to release their data even to company officials. There's a surfeit of caution elsewhere, as well. In the reporting of this story, individuals and organizations using wearable technology, including a strength and conditioning coach at a major university, an NBA team, officials with Major League Baseball and the baseball players union, all declined requests to do on-the-record interviews. Baseball is the only major sports league to allow wearables in-game, including the sleeve. The most recent labor contract is filled with language to protect players in terms of privacy, safety, informed consent and "commercial exploitation by Clubs or MLB." Wearables are revealing more and more about elite athletes. The question is, as the industry continues to emerge, how will all the information be used?